Many artists have been but brief candles, whose light has been extinguished long before it should have: Thomas Girtin (1775-1802) promised to be greater even than JMW Turner, but died, probably of an asthma attack, at the age of just 27. Vincent van Gogh (1853-1890) is now recognised as one of the most brilliant post-Impressionists, but died of a self-inflicted gunshot wound at the age of only 37. This occasional series will focus on painters like Girtin who left sufficient for us to appreciate their talent, but whose work has largely been eclipsed by those who lived longer. 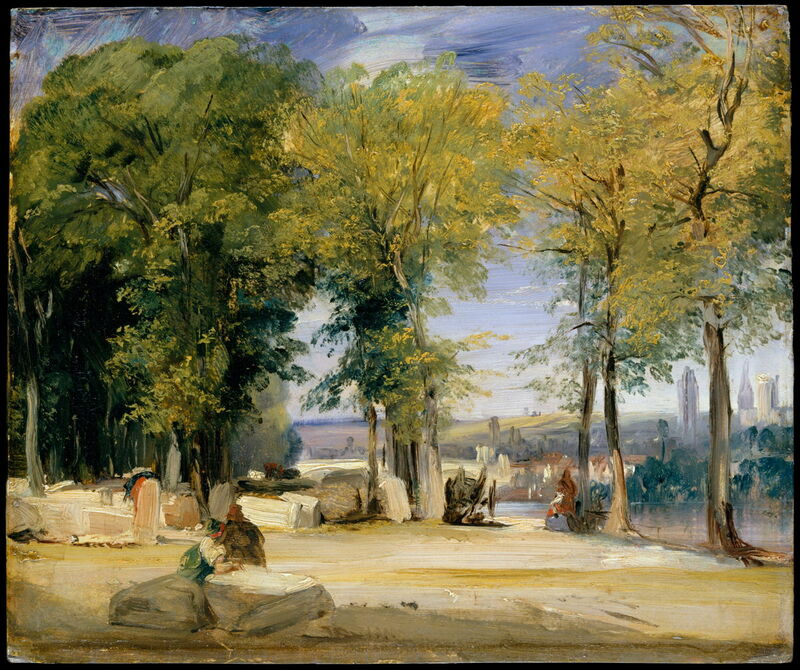 The first, subject of this and the next article, is Richard Parkes Bonington (1802-1828), who did not survive to his 26th birthday, but died very rapidly of pulmonary tuberculosis. Among those who paid tribute to his short life and brilliant work were Delacroix, Isabey, and Huet. Bonington was born near Nottingham, England. His father had inherited the post of Nottinghamshire jailer in 1789, but before his son was born, father had abandoned that to be a drawing instructor and portrait painter, and had become a reasonably successful provincial artist. The early years of the nineteenth century were financially difficult, and father and mother saw their income falling, so decided to move to France. His father set up a lace factory in Calais in 1817, then moved to Paris the following year to establish a lace shop. Bonington (the son) was first taught painting by his father, but was rescued from that by Louis Francia, who had recently returned from England. He also copied in the Louvre, and in 1819 enrolled in the atelier of Baron Gros at the Institut de France, the most prestigious in France at that time. Among his fellow students were Paul Delaroche, Robert-Fleury, and Charlet. Bonington and Gros did not get on well at first, but became reconciled over time. Richard Parkes Bonington (1802–1828), View of the Pont des Arts from the Quai du Louvre (c 1819-20) (14), watercolour over graphite on medium, cream, slightly textured wove paper, 21 x 29 cm, Yale Center for British Art, New Haven, CT. Wikimedia Commons. Among his favourite views for watercolours were those of the Hôtel des Invalides, Paris from the Père-Lachaise Cemetery, and this View of the Pont des Arts from the Quai du Louvre (c 1819-20). 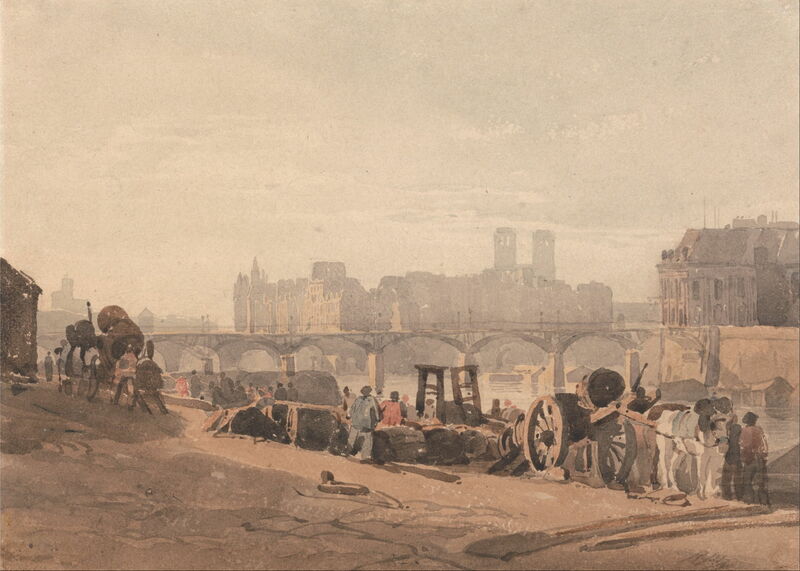 With these watercolour views of Paris selling quite well, Bonington toured Normandy in the autumn of 1821, returning via Rouen. During that he started to develop his interest in coastal landscapes, which were to remain central for the rest of his career. He started to exhibit in the Salon from 1822, and to produce illustrations for travel books published by his father and Ostervald, who also dealt in British paintings. Richard Parkes Bonington (1802–1828), Near Honfleur (c 1823) (80), watercolour over graphite on medium, cream, moderately textured wove paper, 20.8 x 27.1 cm, Yale Center for British Art, New Haven, CT. Wikimedia Commons. By 1823, Bonington’s watercolours had become very popular, with many being turned into prints, and were generating a healthy income for him and his parents. That year he toured north from Rouen along the coast to Calais and Flanders, then back to Paris via Amiens. 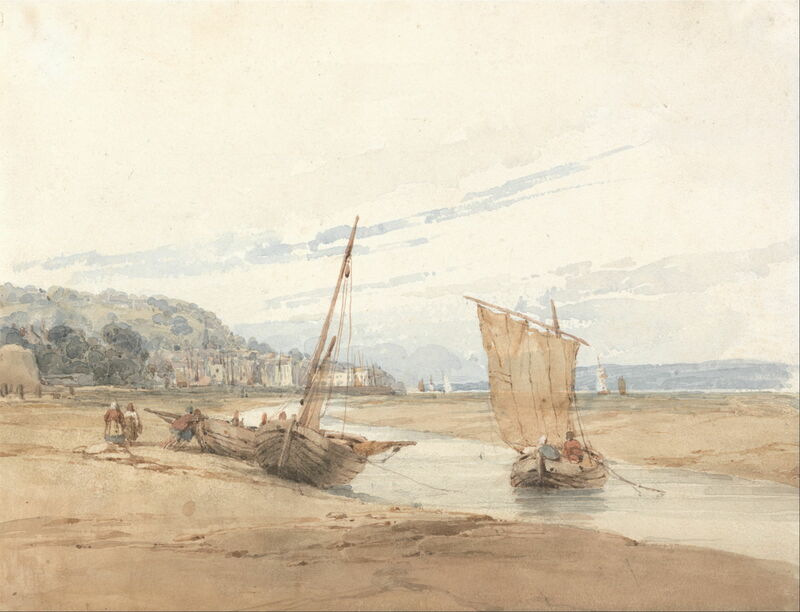 Typical of the views which he painted then is this watercolour Near Honfleur (c 1823), although this does not appear to be turned into a print. Richard Parkes Bonington (1802–1828), Fishing Boats Aground (c 1823-4) (92), watercolour over graphite, 13.7 x 18.2 cm, Yale Center for British Art, New Haven, CT. Wikimedia Commons. 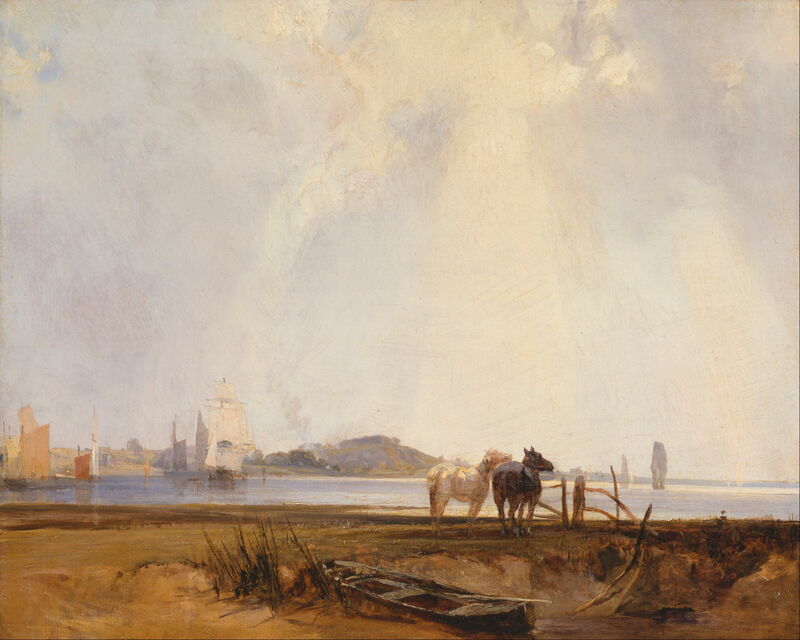 In early 1824, Bonington, in company with his colleague Colin, sketched and painted in Dunkerque and along the north coast again; although Colin returned earlier, Bonington did not get back to Paris until the early summer. 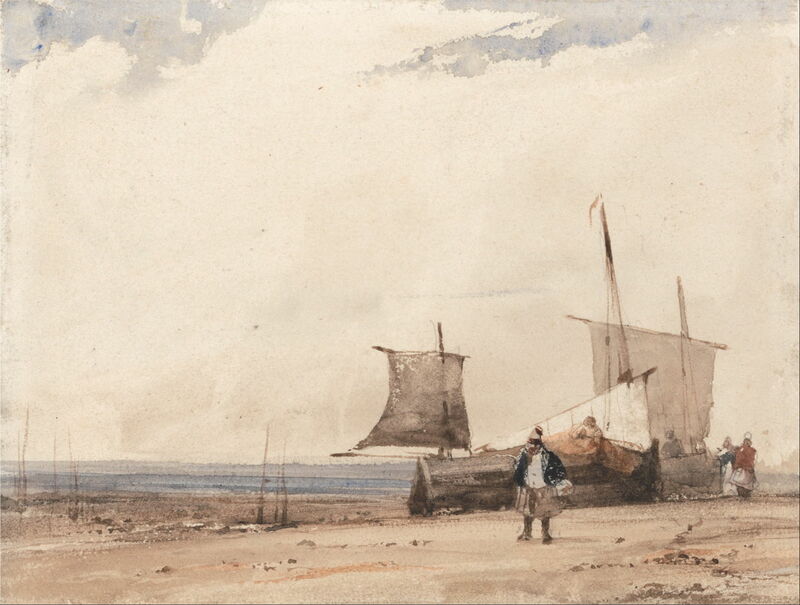 Among the watercolour views which he painted around this time was Fishing Boats Aground (c 1823-4). He was then working successfully in oils as well as watercolours, and in the summer of 1824 had two oils and a watercolour accepted for the Salon and sold for 500 francs each in advance. He was also awarded a gold medal at that Salon, alongside Constable and Copley Fielding, and Sir Thomas Lawrence was awarded the Legion of Honour. Bonington returned to Dunkerque and continued to paint. 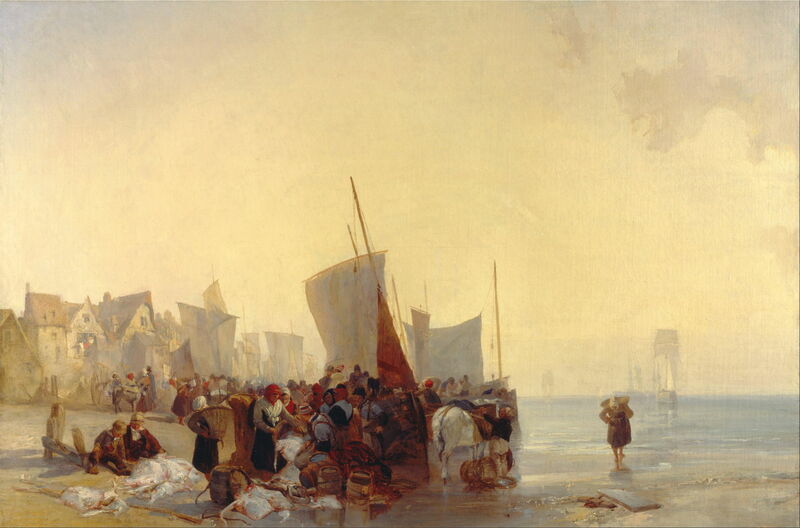 Richard Parkes Bonington (1802–1828), A Fishmarket near Boulogne (1824) (171), oil on canvas, 82 x 122.5 cm, Yale Center for British Art, New Haven, CT. Wikimedia Commons. 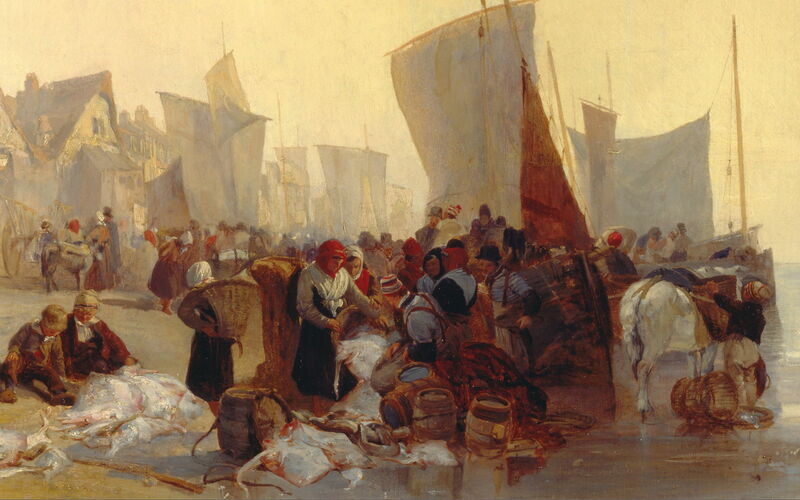 It has been suggested that Bonington’s A Fishmarket near Boulogne (1824) was one of his paintings exhibited in the Salon in 1824, but Noon points out that this canvas was larger than any of Bonington’s listed for that Salon. It is, without doubt, one of his most significant early paintings, and probably one of the best of his brief career. Richard Parkes Bonington (1802–1828), A Fishmarket near Boulogne (detail) (1824) (171), oil on canvas, 82 x 122.5 cm, Yale Center for British Art, New Haven, CT. Wikimedia Commons. This detail view shows how loosely he handled many of the figures and objects, and the exaggerated aerial perspective which gives the work such depth. Richard Parkes Bonington (1802–1828), Near Quillebeuf (c 1824-5) (178), oil on canvas, 42.5 x 53.4 cm, Yale Center for British Art, New Haven, CT. Wikimedia Commons. Another early and successful oil painting, his Near Quillebeuf (c 1824-5) may have a little influence from Constable in the foreground, but otherwise shows similar style to A Fishmarket near Boulogne. Richard Parkes Bonington (1802–1828), Fishing Vessels in a Choppy Sea (1825) (99), watercolour, 14.1 x 23.1 cm, Museum of Fine Arts, Budapest, Hungary. Wikimedia Commons. 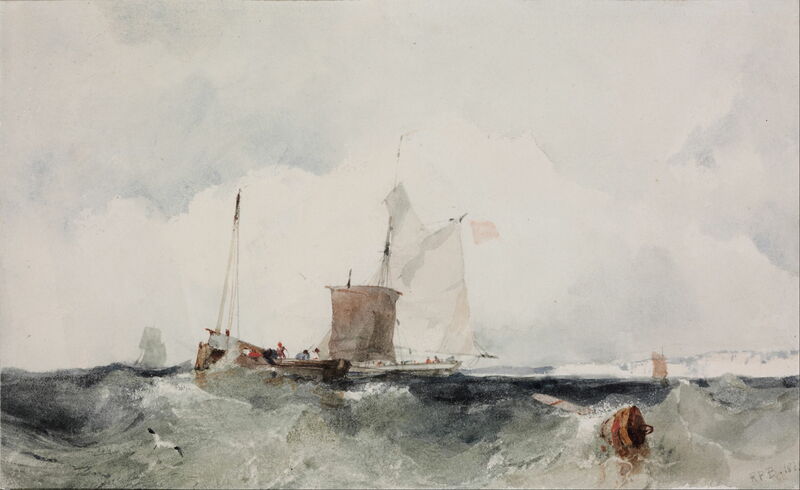 Fishing Vessels in a Choppy Sea (1825) was probably a watercolour copy of his A Sea Piece (c 1824), which may have been inspired by Turner’s marines. It was probably painted at Cap Blanc Nez off Wissant. In May 1825, Bonington and Colin visited London, where they met up with Delacroix. There they studied public and private collections, and enjoyed many visits to the theatre. Richard Parkes Bonington (1802–1828), Beached Vessels and a Wagon near Trouville (c 1825) (179), oil on canvas, 37.1 x 52.2 cm, Yale Center for British Art, New Haven, CT. Wikimedia Commons. 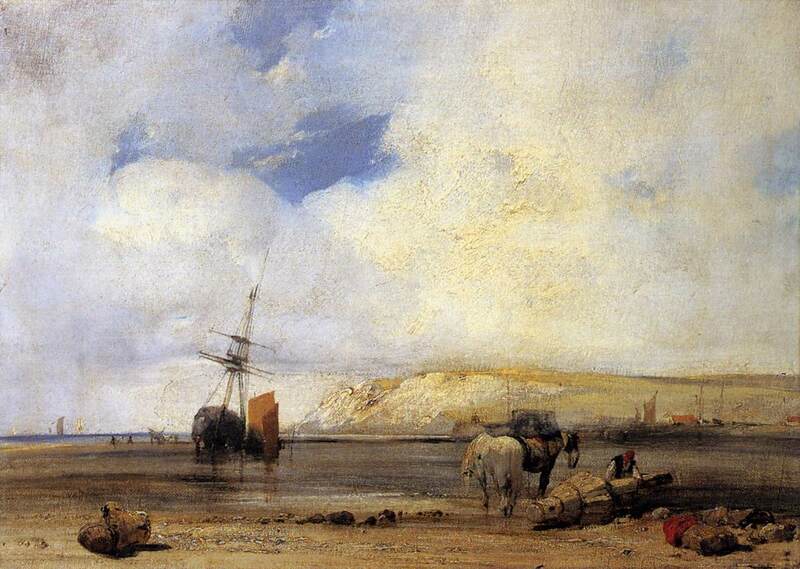 Bonington’s Beached Vessels and a Wagon near Trouville (c 1825) may have been painted when he visited Trouville with Eugène Isabey after their return from England in the summer of 1825. 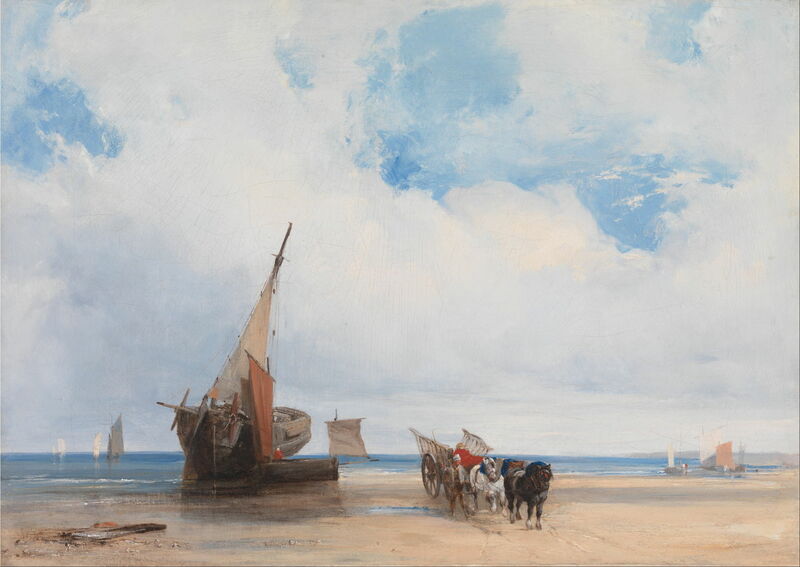 Some have suggested that the wagon is another influence from Constable, but Noon points out that such vehicles were commonly used around the coast, and appear in other paintings by Bonington. Richard Parkes Bonington (1802–1828), In the Forest at Fontainebleau (c 1825) (188), oil on millboard, 32.4 x 24.1 cm, Yale Center for British Art, New Haven, CT. Wikimedia Commons. In the Forest at Fontainebleau (c 1825) was probably painted after his visit to London, and together with a related graphite sketch, is the only evidence for Bonington having visited Fontainebleau. 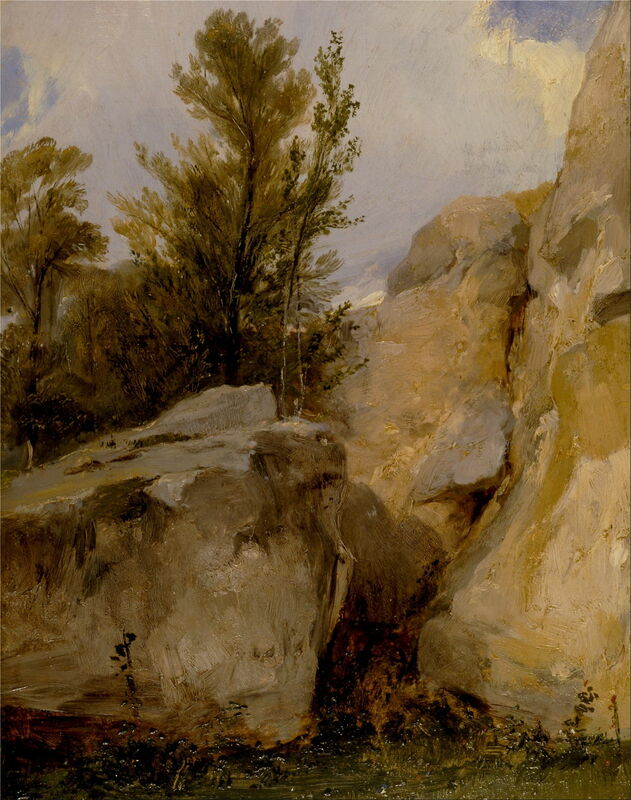 The rocks are shown in a particularly painterly way, suggesting that it may have been started (if not completed) en plein air. Richard Parkes Bonington (1802–1828), On the Coast of Picardy (c 1825-6) (187), oil on canvas, 36.8 x 50.7 cm, The Wallace Collection, London. Wikimedia Commons. On the Coast of Picardy (c 1825-6) shows the Channel coast, probably just north of Le Havre, an area which was to prove popular later with JMW Turner and later still the Impressionists. 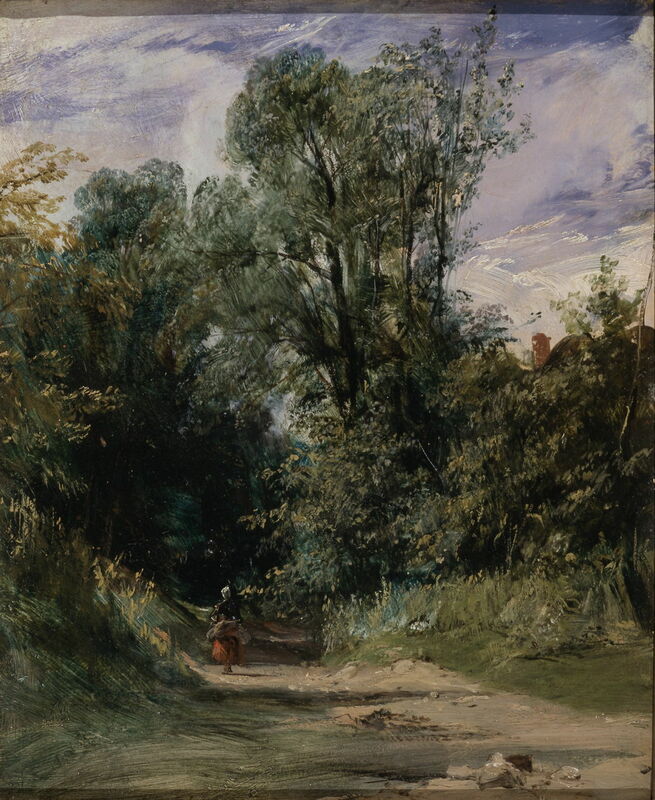 Bonington does not appear to have painted many woodland landscapes, but his A Wooded Lane (c 1825) was probably influenced by Paul Huet, with whom Bonington travelled around Rouen and Mantes in the autumn of 1825, rather than Constable. Richard Parkes Bonington (1802–1828), Near Rouen (c 1825) (194), oil on millboard, 27.9 x 33 cm, Metropolitan Museum of Art, New York, NY. Courtesy Metropolitan Museum of Art. Bonington’s finest painting of woodland is undoubtedly his Near Rouen (c 1825) from that same campaign with Huet. Showing Rouen in the distance, it appears to have been a plein air oil sketch, with particular emphasis on development of the trees, which pop out in their detail from the loosely roughed-in sky. 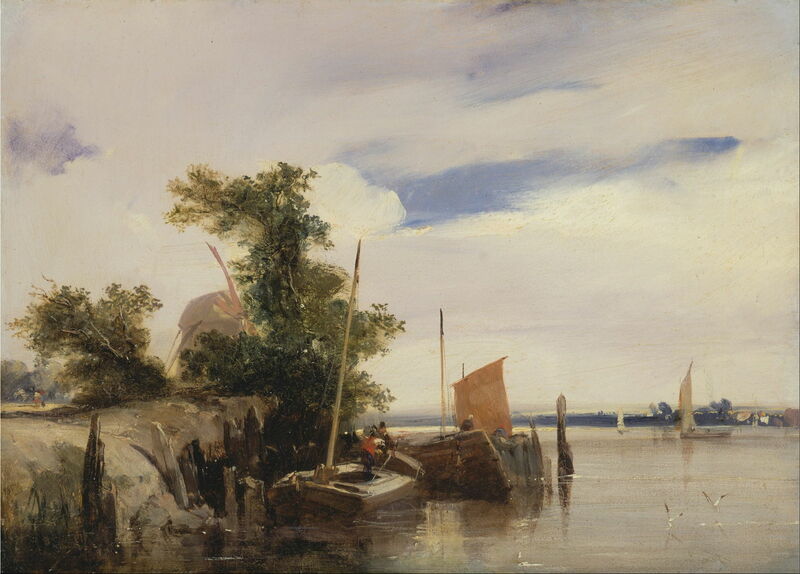 Richard Parkes Bonington (1802–1828), Barges on a River (c 1825-6) (197), oil on millboard, 25.1 x 35.3 cm, Yale Center for British Art, New Haven, CT. Wikimedia Commons. Barges on a River (c 1825-6) was probably painted during that trip too, in the vicinity of Mantes. The windmill seen behind the trees helps make this reminiscent of seventeenth-century Dutch landscape painting. The next article will cover the last three years of Bonington’s paintings. Posted in General, Painting and tagged Bonington, Colin, Constable, Delacroix, Gros, Huet, oil painting, painting, watercolour. Bookmark the permalink. His work is amazing! Thanks for sharing. I look forward to reading more of your posts. Thank you. I hope that you will also enjoy part 2, which I am working on at present, and should be posted here tomorrow.